Fr. 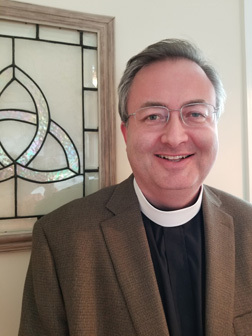 Jonathan comes to All Saints from St. James Episcopal Church in Hendersonville, NC, where he was Director of Faith Formation. Prior to that he was a Pastor and District Pastoral Leader in Grace Communion International, serving in the Nashville, TN, area. He earned his Master of Divinity degree from Campbell University Divinity School in 2000 and, he earned a Master of Sacred Theology degree in Anglican Studies from the School of Theology at the University of the South, in 2018. He and his wife, Beth, have two children, their eldest is in college and their youngest is in Middle School. Fr. Jonathan is from Hendersonville, NC, originally and was sponsored for ordination to the priesthood by the Episcopal Diocese of Western North Carolina, the Diocese of which All Saints is a part.